Budget air travel is a big news topic with frequent discussions about their environmental impact and the bringing of foreign travel to the masses. However, having just flown to Verona from London Stansted via Ryanair last week with my wife I have to comment on something that's rarely discussed, specifically about Irish low-fares airline Ryanair: the travel experience. Some of the following applies to other budget carriers, but there is something fascinating at work with Ryanair that I think is unique to them. I'll summarise my point in a few examples so that this doesn't turn into a rant about a single bad experience - there is a bigger point here, which I'll outline at the end. 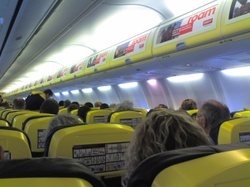 • Our flights were flagged up on the Ryanair website as costing €0.01 each. What's the point in even pretending that this is for real? After tax and charges, the flights came out at over €40.00 each. That's not actually a lot of money, but right from the word go we were feeling ripped-off. • Arriving at Stansted Airport we discovered that Ryanair's baggage allowance had dropped from 20 kilos to 15 kilos. An additional £38 had to be paid for our now "overweight" suitcase. Everyone in the queue in front and behind us had to pay too. Not surprisingly much aggrievance was being aimed at the staff. • Next was the ongoing attempt to sell us a Priority Boarding Pass for an extra few quid. Right up to the departure gate, Ryanair staff were selling these passes like raffle tickets to the extent that about a third of the flight had them (60 are offered on planes with a capacity of 189). Surely their usefulness diminishes the more they issue? No-one seemed to realise this, but the result was that it caused a lot of tension and bad feeling in the many queues as everyone who'd paid their money felt that it entitled them to go to the front of every queue. 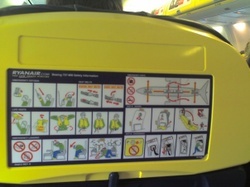 • When you get on the plane, its interior is full of Ryanair's migraine-inducing corporate yellow plastic. It's made even worse with banner ads pasted on all of the over-head lockers. • In order to save an inch and make cleaning easier the elasticated magazine holders on the chairs in front have been removed. I imagine that cumulatively they've saved enough space to add another row. Here's the thing, though, the safety card is stuck on the headrest twelve miserable inches in front of your face. Now, I fly a lot, but I hate every gut-wrenching minute of it. So, why throughout my two hour flight must I be reminded that the plane might crash?! Maybe it's to make me buy a drink from their over-priced trolley service. • I don't even get a free cup of tea, but I have to endure constant tannoy announcements advertising said trolley service, the sale of duty free tat, and worst of all, their charity-scam scratchcards. Ryanair is a deeply tacky brand - and they have no shame about it. So, the point I promised: When calculating the price for a service, one puts unit cost and sales on a graph. The optimum cost to charge for a service is the intersection, with the highest price that the greatest number of customers will pay. With Ryanair, though, it appears that their business model is based on how much appalling service they can pile on before the customer finally snaps and decides that the mythical "low price" ticket simply isn't worth the utterly miserable travelling experience that accompanies it. ps If you get so annoyed with Ryanair's pathetic service, they are currently promoting a free in-flight punch-up on their web site. Our flights were flagged up on the Ryanair website as costing €0.01 each. What's the point in even pretending that this is for real? After tax and charges, the flights came out at over €40.00 each. That's not actually a lot of money, but right from the word go we were feeling ripped-off. I am interested in it for a long time! Our flights were flagged up on the Ryanair website as costing €0.01 each. What's the point in even pretending that this is for real? After tax and charges, the flights came out at over €40.00 each. That's not actually a lot of money, but right from the word go we were feeling ripped-off. What remarkable post! An informative blog! I am also looking for Hawaii Wedding Professionals please provide the numbers. The interesting information, the tonic on a note! I am also looking for Hawaii Wedding Professionals please provide the numbers.GooD luck!!!!!! An informative blog! I am also looking for Hawaii Wedding Professionals please provide the numbers. nice post... just keep updating it I'm looking forwards to your new post. An informative blog! Which type of economy can give happyness and minimal or reasonable standard of living to the people of India? The interesting information, the tonic on a note! I am also looking for Hawaii Wedding Professionals please provide the numbers. Looks like you had a good trip back and forth. Really your blog is very interesting.... I'm really happy to reading it. just keep updating it I'm looking forwards to your new post. Religiously speaking: christians: How effective are you spreading your messiahs Love and Peace message? That's just plain sad. Hope it didn't ruin your whole trip, though.